Get the certifications you need and extend your global footprint. From the widely recognised ETL mark for USA and Canada to ATEX and IECEx certification, our team of engineers and technicians have the experience and know-how to help you through the certification process and provide training and technical service solutions designed with you in mind. We offer Hazardous Goods Handling Agent, these services are executed with perfection by a team of diligent and skilled professionals. We carry a large quantity of liquids mainly Non Petroleum Oil and Lubricants (Non-POL) like fatty acid, crude palm oil, molasses, chemicals etc. These are non DG cargoes and are usually acceptable by most lines. We have a highly trained team that deals with shipment/procurement of dangerous & hazardous goods and all our activities are in accordance with the global safety standards. We provide our clients with a complete understanding of the steps involved in transporting such goods. 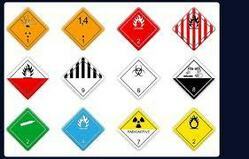 Our handling of such type of dangerous & hazardous goods is from one door to another. : Safe handling of goods classed as 'dangerous / hazardous' is another service offered by GRT. The transport of such items is regulated, and these articles or substances are deemed safe for transportation by air, sea or road, if they meet the requirements specified in the current edition of the Global maritime organizations. We offer well planned services for hazardous materials shipping and hazardous material handling. These services are planned as per the budgetary constraints of the chemical manufacturers and suppliers and we use superior quality packing material.